What special dinner would be complete without dessert? 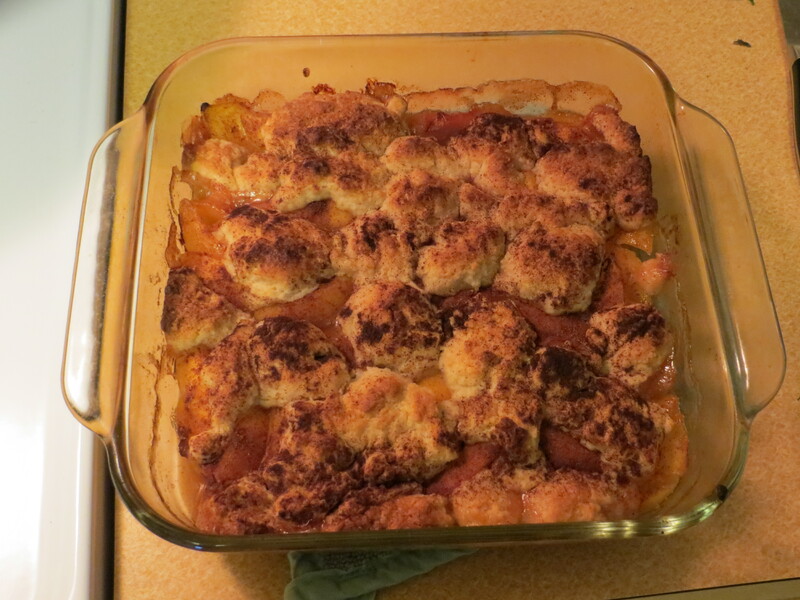 To round out the end-of-summer feast that John and I made for ourselves, I prepared Ellie Krieger’s Peach Cobbler recipe from her Comfort Food Fix cookbook. While I may not have been counting Points for this dinner, I wanted a dessert that would not leave me feeling too guilty afterwards. I used frozen peaches instead of fresh, as I had not been impressed by the fresh peaches at the store. I prepared the cobbler in stages while also tending to the Sautéed Swiss Chard and Easy Rolls. The timing worked out perfectly, as I had the cobbler ready to go in the oven just as John and I sat down at the table. While we dived into the Creole Pasta and side dishes, the cobbler baked and bubbled in the oven. We then enjoyed the cobbler warm, almost straight from the oven. I topped each serving with two spoonfuls of Blue Bell’s no-sugar-added low-fat vanilla ice cream. 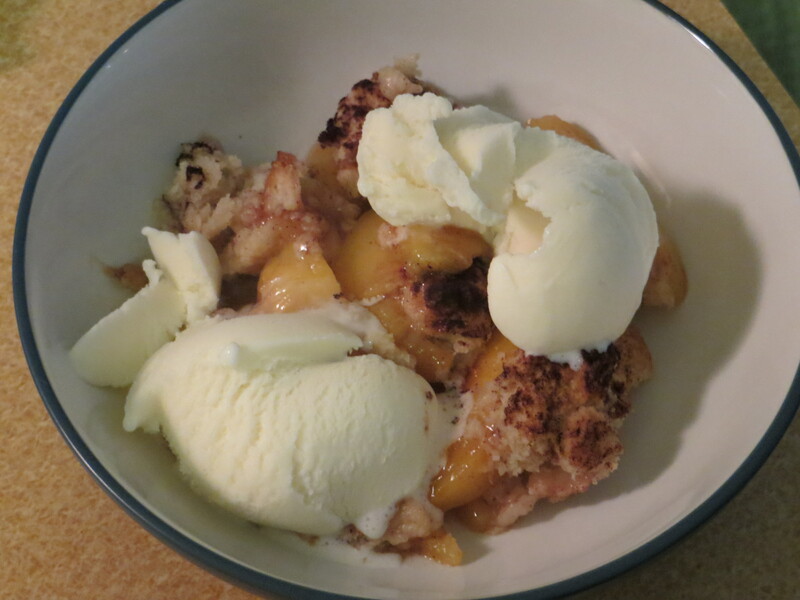 (In my book, cobbler should only be eaten warm, with vanilla ice cream melting all around it.) The cobbler was delicious, earning 4 stars. Fresh, at-their-peak peaches would have sent the rating even higher, I believe. Also of note: the cobbler was even better the second day. 3. In a large bowl, toss together the sliced peaches, lemon juice, cinnamon, and corn starch. Add the brown sugar, 1 teaspoon at a time, to taste depending on the sweetness of the fruit. Pour the peach mixture into an 8-inch square baking dish. 4. To make the topping, in a medium bowl, whisk together the flours, granulated sugar, baking powder, and salt. Add the milk, butter, and oil and stir to combine. Distribute spoonfuls of the batter over the peaches, leaving some patches uncovered. Sprinkle with the cinnamon. Bake until golden brown, 30 to 35 minutes. Yield: 6 servings (serving size: ¾ cup). Per serving, 6 PointsPlus.